Coney Island’s massive new 11-story, 350,000-square-foot hospital building is moving forward. The establishment and project review committee on the state’s Public Health and Health Planning Council has advanced the application from NYC Health + Hospitals to the full council, according to Crain’s. 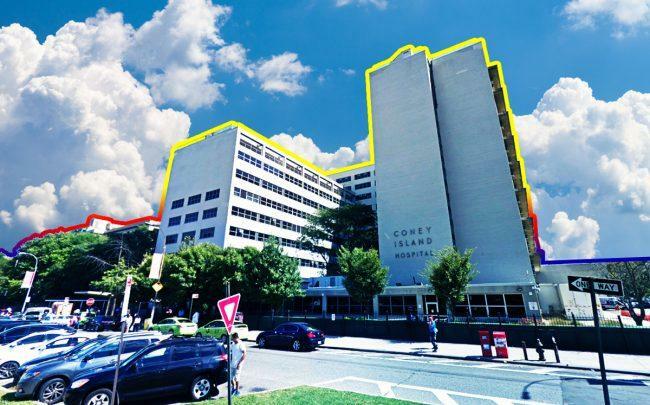 Coney Island Hospital plans to spend $738 million on the development, which aims to fix flooding damage from Superstorm Sandy. The hospital will renovate its main building, which was built in 1954, and demolish an older building damaged in the hurricane. The project will also include the installation of a flood wall around the campus and a new critical services tower that will have a flood-resistant emergency department. The project is mainly funded by $1.7 billion from the Federal Emergency Management Agency that NYC Health + Hospitals received in 2014, $922.7 million of which is slated for Coney Island repairs. The health system hopes to finish the project in April 2023.